In the following articles, members of the Democratic Socialist Movement (DSM, an affiliate of the Committee for a Workers' International and the Socialist Party's counterpart in South Africa), explain their important role in the continuing miners' struggle. 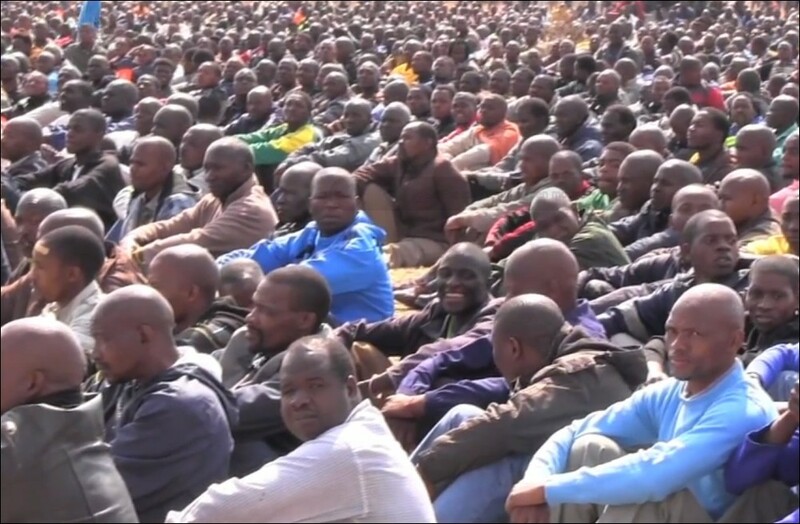 The battle of the South African miners is reaching a crucial stage with the movement escalating and the employers starting to introduce disciplinary measures, including the closure of striking miners' hostels and widespread sackings. 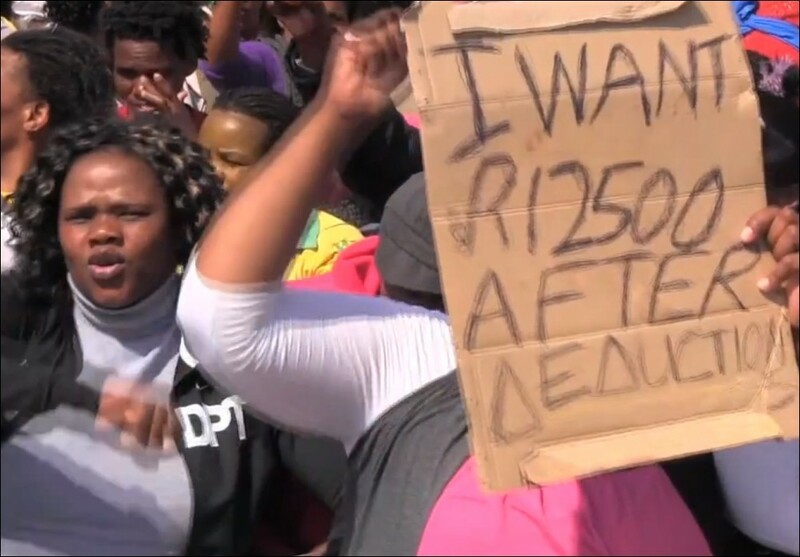 The workers, who continue to fight in the Rustenburg area, successfully launched a Strike Coordinating Committee, now made up of the leadership of each of the 15 shafts 'illegally' on strike. 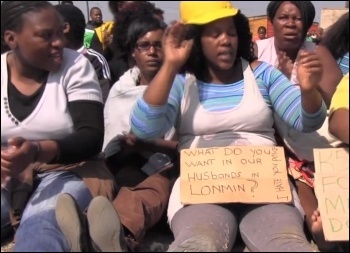 Mineworkers in other provinces outside of the North West province, where Rustenburg is located, have called upon the Committee to visit them to give them the opportunity to become part of the strike movement. This includes goldmines in Carletonville, in the Gauteng Province - the industrial heartland of South Africa, where workers have been on strike and had refused to be addressed by the NUM president. The KDC West Goldfields strike committee in Carletonville has agreed to put the issue of affiliation to the Committee to their members for a mandate. There have also been similar calls from mineworkers in the provinces of Limpopo and the Free State. Alarmed by the manner in which its biggest and richest affiliate, the NUM, is being bypassed by the Coordinating Committee, the general secretary of the Congress of South African Trade Unions (Cosatu), Zwelinzima Vavi, has elbowed the NUM leadership aside and intervened to overturn the NUM's denunciation of the workers' demand for R12,500 (£928) monthly wage. At a several thousand-strong rally of striking Anglo Platinum miners last week the five platform speakers included two miners' leaders, DSM comrade Mametlwe Sebei, the main leader of the strikes, and Alec Thraves who brought greetings from the Socialist Party of England and Wales and the CWI - whose message was received with loud cheering and cries of "Amandla" (Zulu for power). South African radio and television interviewed comrade Alec and the Socialist Party's support for the strike was transmitted across South Africa. The DSM's role in mobilising support and publicity for the 400 workers who occupied the Samancor Chrome mine shaft was applauded by a 50-strong meeting of the Coordinating Committee in Rustenburg. DSM members are travelling thousands of kilometres every week across the Rustenburg region and beyond, helping to coordinate the action of the striking miners. The DSM is appealing to members and supporters of the CWI to help finance this activity. Make donations payable to Socialist Party and send to 'South Africa Appeal', PO Box24697, London E11 1YD. 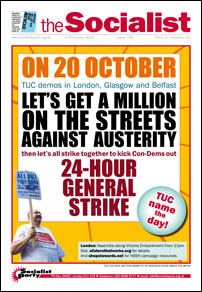 A leading trade union activist and Democratic Socialist Movement member from Rustenburg, South Africa, will be speaking at Socialism 2012 in London on 3rd and 4th November on the miners' general strike and the political tasks facing the South African working class.